Dr. M. Kabir Hassan is a financial economist with consulting, research and teaching experiences in development finance, money and capital markets, corporate finance, investments, monetary economics, macroeconomics and international trade and finance. He has published five books, and over 70 articles in refereed academic journals. 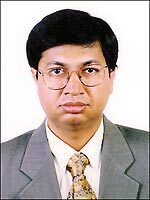 He has presented over 100 research papers in professional conferences in such countries as the United States, the United Kingdom, Australia, Canada, Malaysia, Turkey, Portugal, Morocco, Qatar, Oman, United Arab Emirates, Bahrain, Iran, Sudan, Saudi Arabia, Egypt, Kuwait, Indonesia, Brunei, South Africa and Bangladesh. He has also presided over many sessions at professional and international seminars. Dr. Hassan has great experience in the privatizing process of public sector industries. He has great experience in training through workshops, seminars, and formal classes. Dr. Hassan worked on impact of globalization of financial markets on developing countries, privatization of commercial banks in developing countries, impact of trade liberalization on the efficiency of industry, efficiency and performance analysis of commercial banks, financial sector reform in developing countries, euro impact of the MENA countries, and regional economic integration either as consultant of the USAID, the World Bank, IDB, ICDT, Government of Bangladesh, USIA and the Nathan Associates. Dr. Hassan visited International Monetary Fund (IMF) as a Visiting Scholar, and written on capital market, interest rate and monetary policies in developing countries. He has also visited Federal Reserve Bank of New York to work on Islamic banking and finance. Dr. Hassan earned a B.A. in Mathematics and Economics with Phi Beta Kappa Honors from Gustavus Adolphus College (a four-year liberal arts college) in 1985 from Minnesota, a M.A. in Economics in 1987 from University of Nebraska-Lincoln, and a Ph.D. in Finance in 1990 from University of Nebraska-Lincoln. Dr. Hassan is a tenured Professor at the University of New Orleans. He was also Visiting Professors at Drexel University, USA, North South University, Bangladesh and American University-Beirut, Lebanon. Dr. Hassan’s primary teaching responsibilities are in the area of financial markets and institutions, corporate finance and international finance. Dr. Hassan teaches commercial bank management and financial management at the MBA level, financial markets and institutions and seminar in markets and institutions at the Ph.D. level. Dr. Hassan teaches Bank Management and Financial Administration in the Executive MBA program of UNO both in New Orleans and Jamaica. Dr. Hassan runs executive development seminars on financial decision making, international banking and finance in the U.S., Jamaica and Bangladesh on a regular basis. Dr. Hassan has received many awards and recognition for his outstanding teaching and research performances. Dr. Hassan has received the Outstanding Teaching Award seven times at the University of New Orleans. Dr. Hassan has supervised fifteen students for Ph.D. degrees. He has served as outside examiner for doctoral theses of students from India, New Zealand, Sweden and Bangladesh. He has received a number of research grants to conduct research in international banking and finance areas. Dr. Hassan has been involved with many civic and cultural organizations. He is on the board of directors of Academy of Financial Services, Asian Pacific American Society, New Orleans Museum of Arts, Association for Economic and Development Studies on Bangladesh, USA. Dr. Hassan is currently the elected Chair of Academy of International Business-SW.